Three posts provide extra space for those lazy days. Great for houses with two cats. This scratcher has plenty of space for the lazy cats to sprawl out, or the active cats to jump around from every angle. 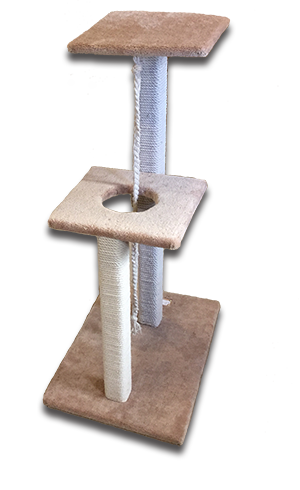 A basic but popular design with two platforms, ideal for cats who love to jump and play. Best suited for the cat who likes to hide, the cubbies will help your cat feel safe while sleeping or sneaky while playing. Bigger is better. Let your cats get up high on this spiral which provides plenty of space for all. Great for several cats or one who thinks he’s the king, this popular design’s best feature is the peek-a-boo hole on the top platform. Perfect for a multi-cat household, this design has two cubbies with various platforms for jumping and playing or just chilling out. Originally a custom design, now a firm favorite. This grand activity centre will keep your cats entertained for years to come..